Our reliable tradespeople will carry out a Everdure gas heater service for you which includes: Checking gas pressures and all fans are operating correctly. Having your Everdure gas heater inspected and cleaned periodically by us who are your authorised Everdure gas heater service technicians will benefit performance, help ensure safe operation, minimize any potential down time and extend the life of your appliance. It is important that your gas heaters are only service by qualified technicians. In most cases, this means a licensed gas fitter or a factory technician. We offer a complete end to end service from repairs and maintenance of your Everdure Gas Heaters to helping you choose the right Everdure gas heating system for your home. We offer a fast and reliable Everdure gas heater service, will always be on time and consider no job too small. We endeavour to provide exceptional customer service and always leave a job neat and tidy. Never attempt to fix a gas appliance or attempt a Everdure gas heater service yourself or allow an unqualified person to attempt to fix it for you. Gas Heater Service Sydney are licenced and qualified gas plumbers, specialising in Everdure Gas Heater Service, Repairs, Installation and Maintenance. 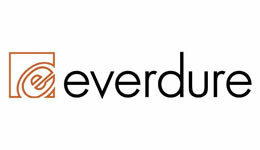 Everdure’s range of radiant/convection heaters are the perfect heating choice. With such a long history of product reliability in the market you can’t go wrong with an Everdure Brigadier. The Brigadier is available in a number of colour options to suit your home and heating large open plan areas up to 90m2. All our Everdure gas heaters are developed with safety in mind and are tested to ensure they comply with the Australian Standards. The Everdure gas heater monitors the level of oxygen in the room and if the level becomes low, the heater will automatically shut off so the oxygen level can restore itself. The front grill is removable, so you are easily able to open the heater and wipe or vacuum dust that accumulates inside. Everdure’s range of radiant/convection heaters are the perfect heating choice. Keep the winter chill at bay with our Everdure great range of gas heaters. 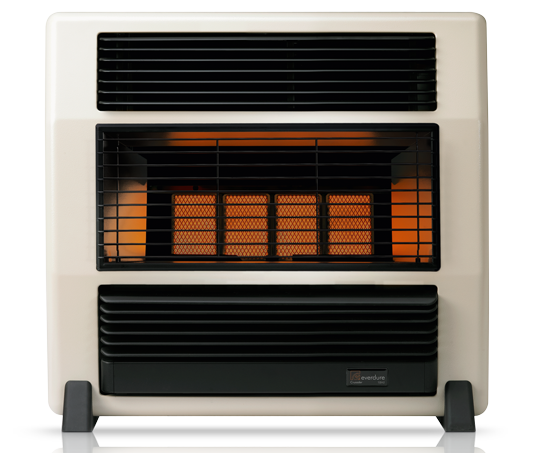 The ideal choice if you have a gas mains supply, a gas heater can look great and keep you warm all winter long. 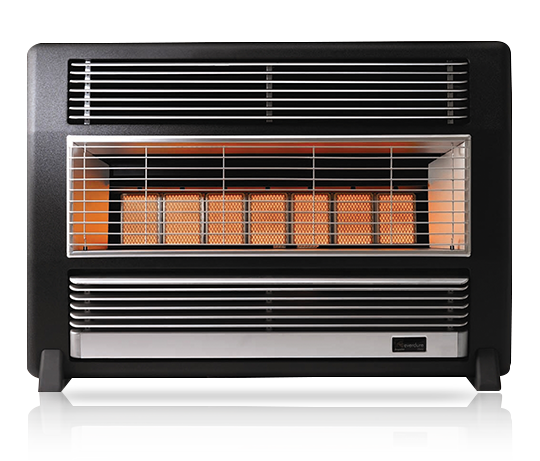 We have a wide selection of gas heaters from top brands such as Everdure and more. You can choose the look you want, the features you want, and the heating capacity you want, for the perfect solution to your home heating needs. It is very important that you understand the correct and safe operation of your Everdure gas heaters. If you don’t have the owner’s manual, most gas appliance manufacturers have them available for downloading on their web sites. Key warning signs that your Everdure gas heater requires servicing are a yellow or red flame, a flame with a yellow burning tip, the accumulation of yellow/brown soot around the appliance, pilot lights that frequently blow out or an acrid smell and eye irritation. 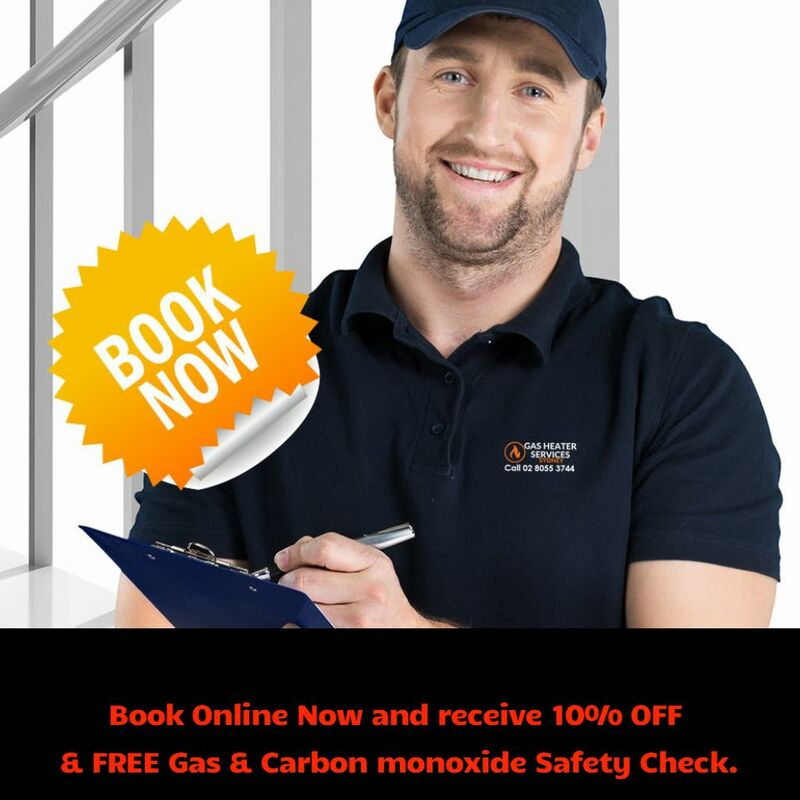 If you experience any signs of carbon monoxide poisoning while operating your Everdure gas heaters, you should stop using it until it is serviced by our gas fitters. You need to schedule regular servicing for your Everdure gas heaters. If you notice anything damaged or abnormal in the operation, look or smell of the appliance, it is best to call us right away. Why Everdure Gas Heaters ? Convection louvers, These louvers direct the flow of warm air into the room, keeping you nice and warm all winter. Control Panel, Easy control panels to select the level of heat desired. Safety Guard, All our heaters are developed with safety in mind and are tested to ensure they comply with the Australian Standards.